Rarely a good series has a great sequel. Even more rarely, a second sequel manage to surpass both previous series become the most spectacular of them all. Of course, I think the it probably has more to do with the book that the series is based off. Nevertheless, without a good execution, even a great story could be ruined. J.C.Staff has indeed done a superb job in bringing the story to the screen. About the series itself, while it started off a little slow, once it picked up the pace, not only it didn't slow down, it managed to get faster and more explosive all the way till the end. Being in such a fast pace, however does have its negative sides: because of the scale this final series is covering--a war between all Flame Haze and Crimson Denizen, there are just way too many characters involved in the story that if it were to cover the background and ability of each character, they could expand the series for an entire long season. What they chose to do, is just dropping characters in the middle of the story out of blue and hoping the audience could understand by using the context of the story flow. For the most part, it worked. But from time to time, I find it a bit irritating when some random people just shows up and somehow become one of those key people that could swing the war one way or the other. You pretty much have no clue why, you just have to take their words for it. 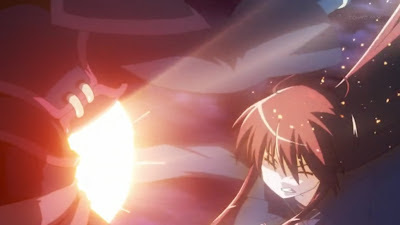 Recommendation:If you liked the previous Shana season at all, you ought to love this one. Endless excitements, guaranteed.